Since 2010, China’s total oil imports have nearly doubled. According to Bloomberg News, China has surpassed the U.S. as the world’s largest oil importing nation. Here’s a chart, showing the trend. As China imports more and more oil, the idea of paying for that oil in yuan instead of dollars becomes more critical. China does not want to use dollars to buy oil. So, China is beginning to squeeze Saudi over the form of currency in which their oil trade is conducted. 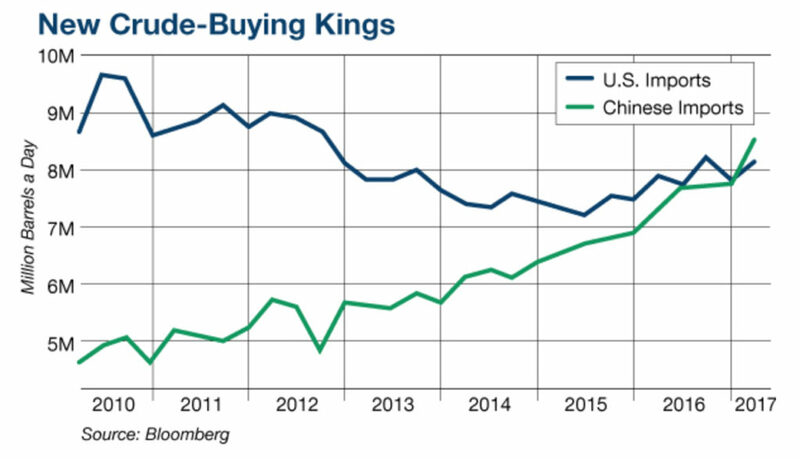 China is doing this by steadily lowering its oil purchases from Saudi. Presently, China’s three top oil suppliers are Russia, Saudi and the West African nation of Angola. Backing-up these three key suppliers are a combination of sources in Iran, Iraq and Oman, which help to diversify China’s oil-supply chain. In the past few years, China has shifted oil purchases away from Saudi, and Russia’s oil exports have risen from 5% to 15% of the Chinese total. China imports more oil from Russia, Iran, Iraq and Oman; less from Saudi. Saudi’s share of Chinese imports has dropped from over 25% in 2008, to under 15% now. Meanwhile, Saudi competitors Russia, Iran, Iraq and Oman are selling more oil to China. Saudi would like to reverse this declining trend of oil-trade with China. However, these kind of major oil flows don’t just happen in a vacuum. There’s a good reason why Russian oil sales to China are increasing. As you’ll see in Nomi’s article, trade and financial services are often closely linked. Over the past few years, China has deepened its trading roots with Russia — now, China pays for Russian oil in yuan. Russia, in turn, uses yuan to buy goods from China. Looking ahead, Saudi Arabia will find itself more and more locked-out of the Chinese oil market if it won’t sell oil for yuan. But to do this, the Saudis must move away from U.S. dollars— and from petrodollars — if Saudi wants to maintain and increase access to China’s oil market. We’ll know more about the likelihood of this after Donald Trump’s tour of the Middle East. Much of this oil-for-yuan news is public information. Yet, for some strange reason, there’s a form of blindness within western policymaking and media circles concerning the implications of yuan-for-oil. The idea is so “off-the-wall” that many policy leaders simply ignore it. Ignore away. But we could wake up one morning in the midst of a massive currency crisis, in which dollar values are falling and oil prices in dollars are soaring.